As a member of two parallel projects sponsored by the Japanese Society for the Promotion of Science (JSPS), a considerable part of my work revolves around the methodological issues of comparison and recursivity. Comparison has been a central tool of anthropological research, but it has lost a lot of its appeal since the 1980s. At the same time, comparing people, things, medications or cultures has rapidly become a part of everyday life, not at least due to technological and scientific innovation. We have organized a session at the 4S Meeting in Tokyo in 2010, and two international symposiums (Traveling Comparisons 2009, Translational Movements 2012) to tackle with such important trafficking between anthropological methods and technosocial realities. The results of these explorations have been published in two special issues of the same titles in the journals of East Asian Science, Technology and Society (see here) and NatureCulture (see here), respectively. I have been affiliated with the Centre for Advanced Research on Logic and Sensibility (CARLS) at Keio University since 2009. This interdisciplinary program houses researchers of many different fields from neuroscience to philosophy, including the relatively small Anthropology Group. The aim of our work is to explore the manifold interactions between emotion and cognition and to invent theoretical frameworks that go beyond such reductions. This project started in 2008 as an exploration into new modes of anthropological inquiry. Young researchers from different Japanese universities have participated covering fields such as economic and medical anthropology, STS and ritual studies. Influenced by the works of Marilyn Strathern, Bruno Latour and Alfred Gell, we looked at contemporary practices where concepts familiar to most anthropologists (gift, culture, performance, risk) are being transformed in the context of everyday life. 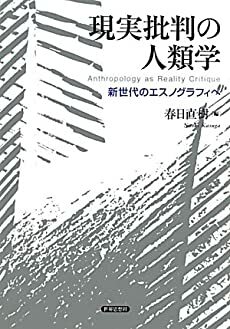 We have compiled a volume in Japanese with the title Genjitsu Hihan no Jinruigaku (Anthropology as critique of reality) edited by Naoki Kasuga. You can read more about it in English in the journal HAU, here.